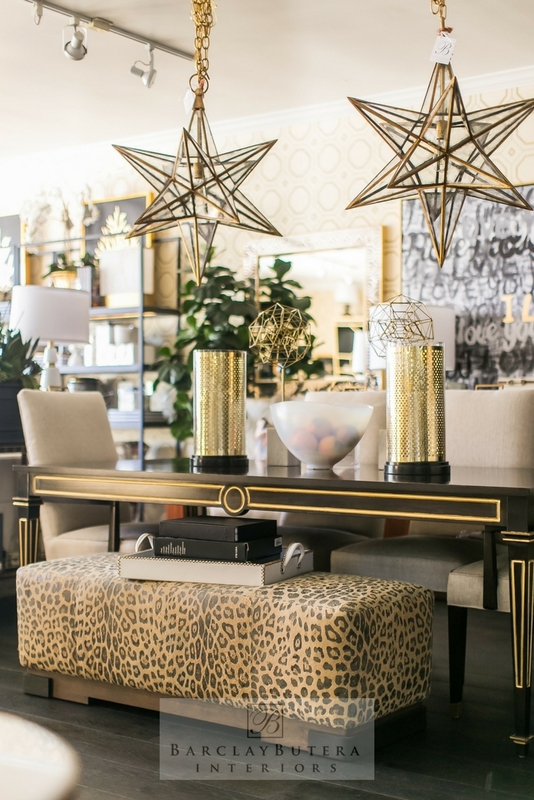 The Inspiring Workspace of Barclay Butera Interiors! As Christmas approaches, we are so excited to bring you, *The Inspiring Workspaces Of America’s Top Designers: Barclay Butera Interiors! As many of you know, this is Part 5 in a 6 part series that we’ve been running here on Hadley Court this year, showcasing interviews about how America’s top designers select their workspaces, set the mood for their client presentations, use branded presentation materials and other interesting facts that we hope will inspire you as you design your own workspaces and offices. 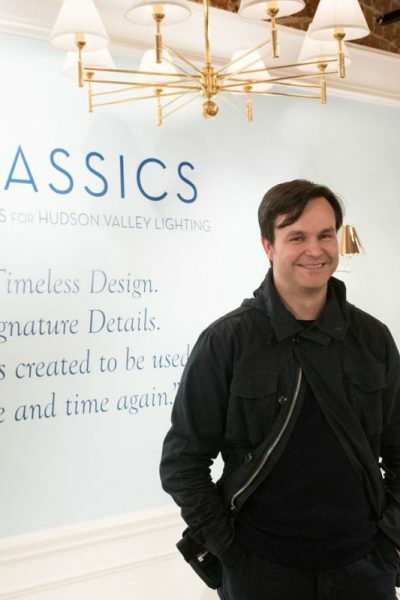 For those of you not yet familiar with Barclay, he opened his design firm 25 years ago, but learned the trade from the ground up, by working for his Mother, herself a talented interior designer. 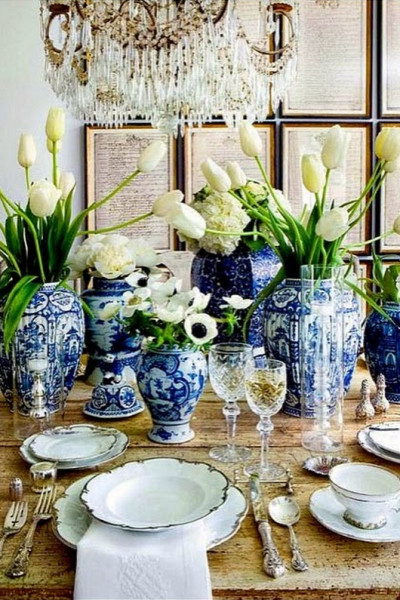 Isn’t it interesting how many of today’s most gifted interior designers come from backgrounds where the importance of interior design as a way to live a gracious, elevated life was valued and expressed within the homes of their parents and grandparents? 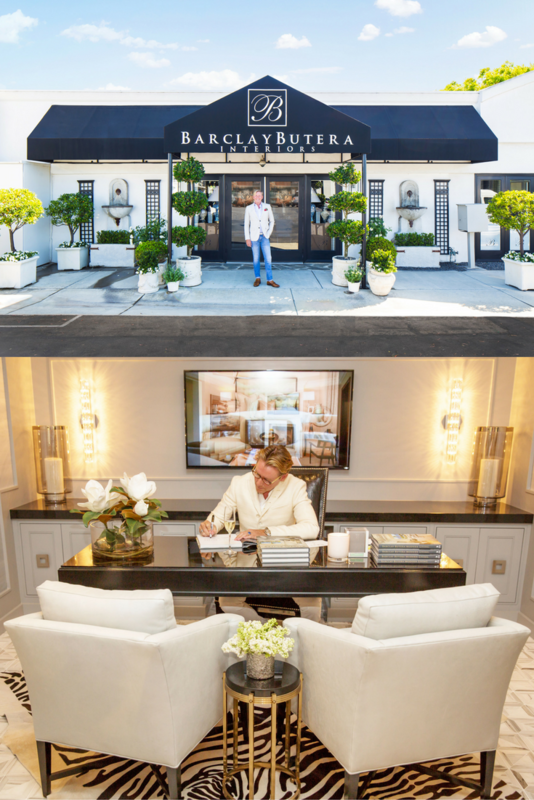 Barclay’s fresh, traditional, glamorous, sophisticated rooms and his innate talent have now been recognized, not only by his elite clientele, but by brands the world over. 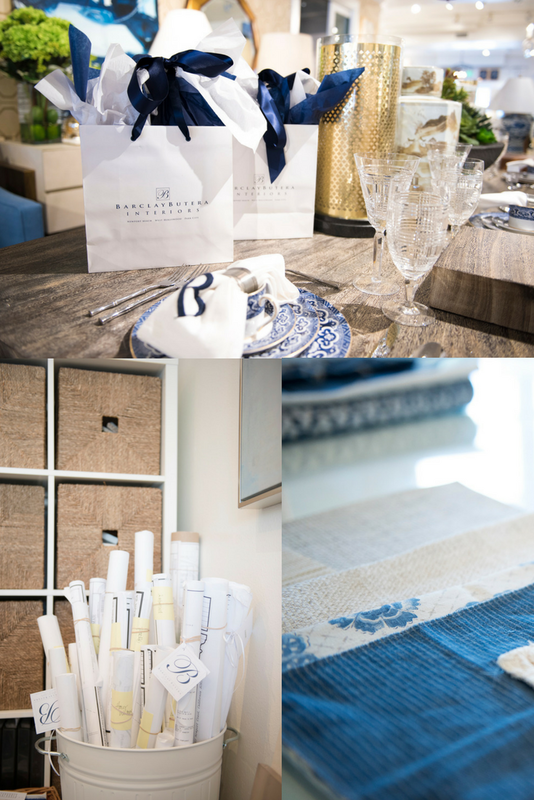 His licensed collection for Lexington Home Brands, which we covered on Hadley Court in an earlier post, just launched this past fall at High Point Market. 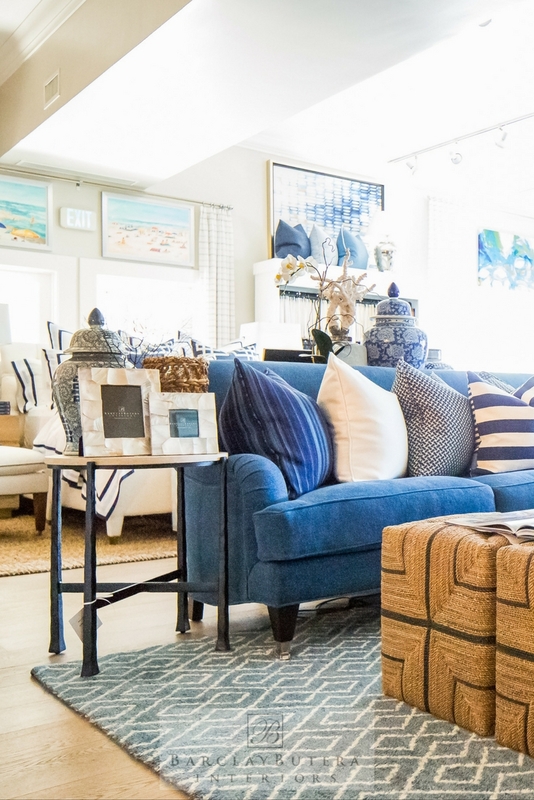 Are you ready now to see Barclay’s recently expanded Newport Beach, California showroom and studio and read his answers to our interview questions? 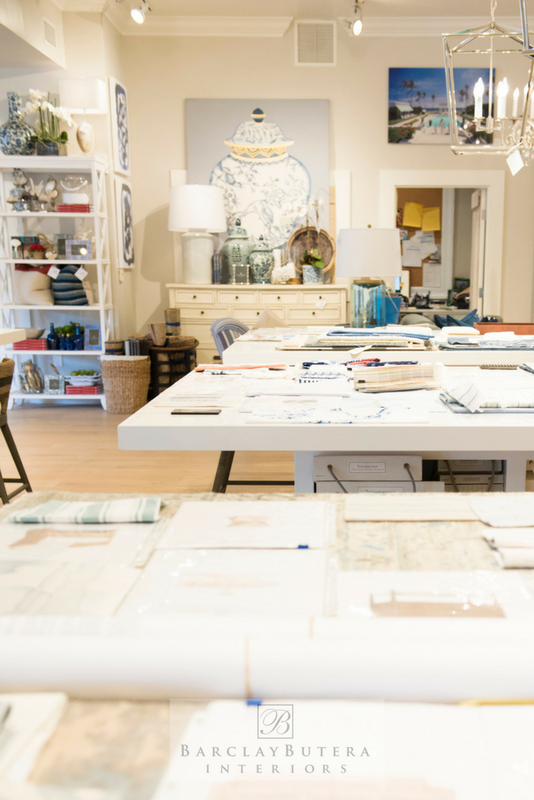 Q: HADLEY COURT: Can you share with us a little bit about how your showroom and workspaces are laid out? What did you take into consideration when planning them? 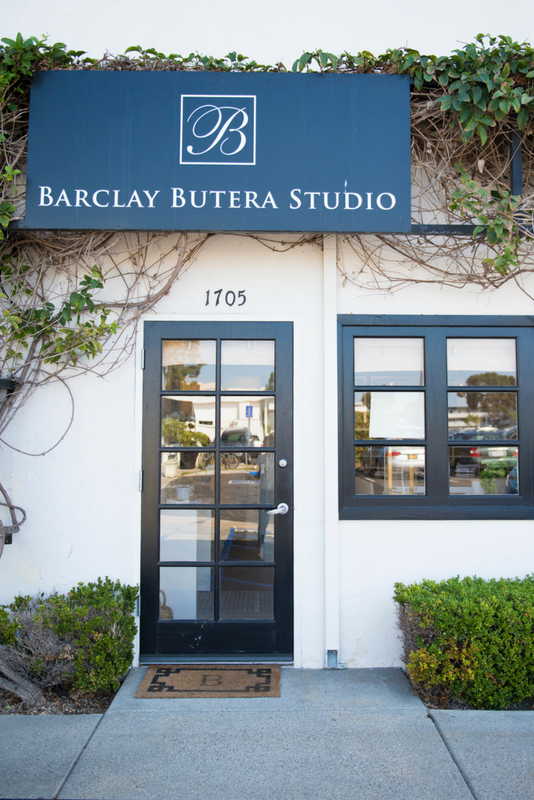 A. Barclay Butera – Our flagship showroom in Newport Beach, California has stayed pretty consistent since I first opened it in 1994. 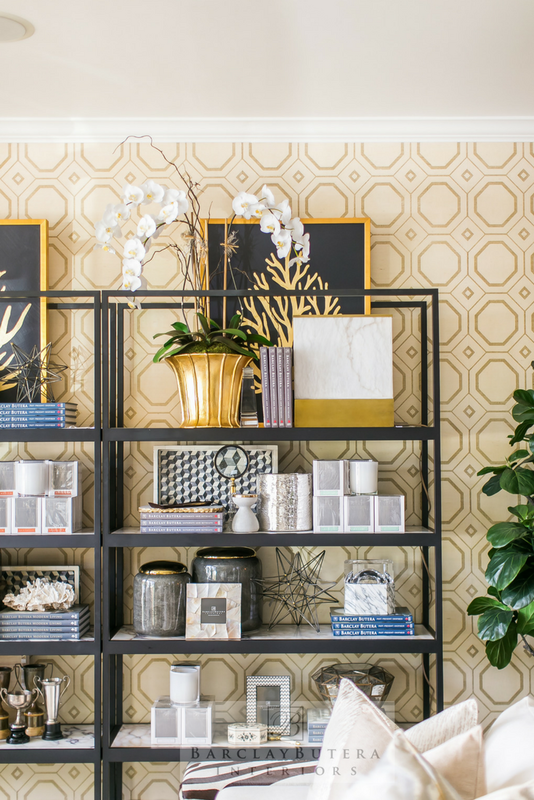 When you walk in, you’re invited to browse and wander by some of our favorite home furnishings and decor items. We use large bookcases to display accessories and you’ll notice we love to layer. More is more! Our front desk, where we carefully package and wrap the purchases of our guests, is in the front of the showroom. 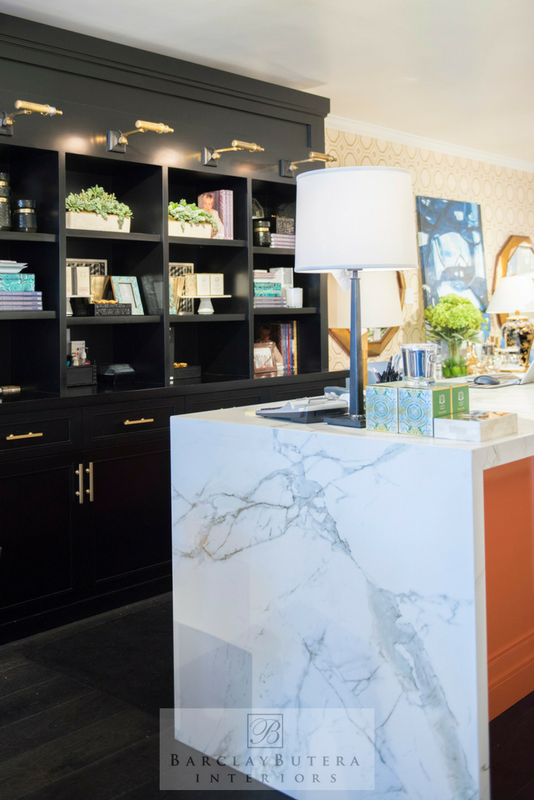 It is always staffed by two members of my team who are ready to answer questions and help our guests feel welcomed and part of the Barclay Butera Interiors showroom experience. Past the front desk is my newly renovated office which you saw in the opening image of this post. We also have three additional offices in the back half of the showroom that the design teams share. We’ve been blessed with growth in projects and staff so we recently updated the back half of the showroom and you’re seeing those images here on Hadley Court for the first time. We added three new work tables for a total of six worktables. 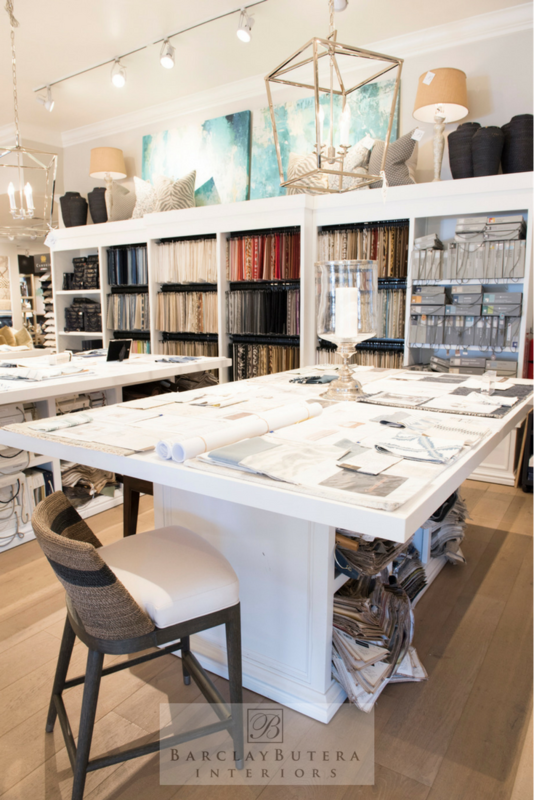 This is where we create our mood boards and often present to clients. It’s important for me to provide my staff with the best resources, tools and workspace and it’s really exciting to see our workspace grow, physically! A few years ago, we also outgrew our space and took over a small design studio in Newport Beach within walking distance from my main showroom. 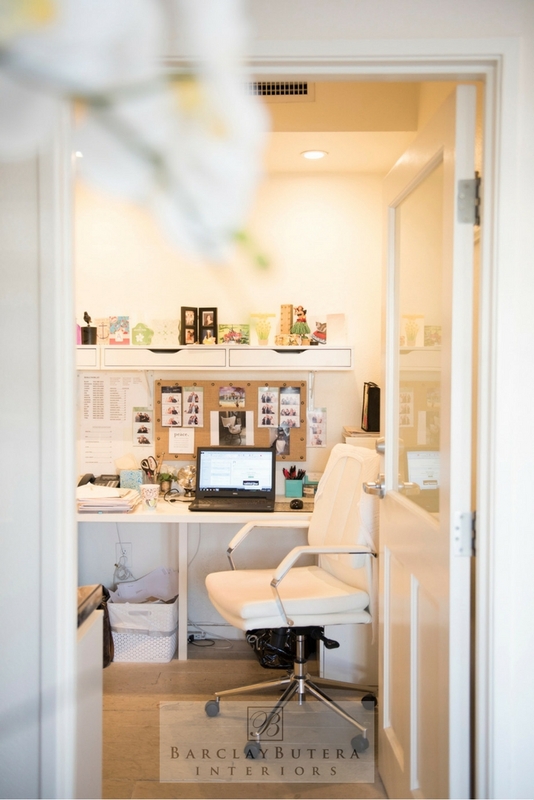 This is where my personal design assistants work out of and it’s a great little space. 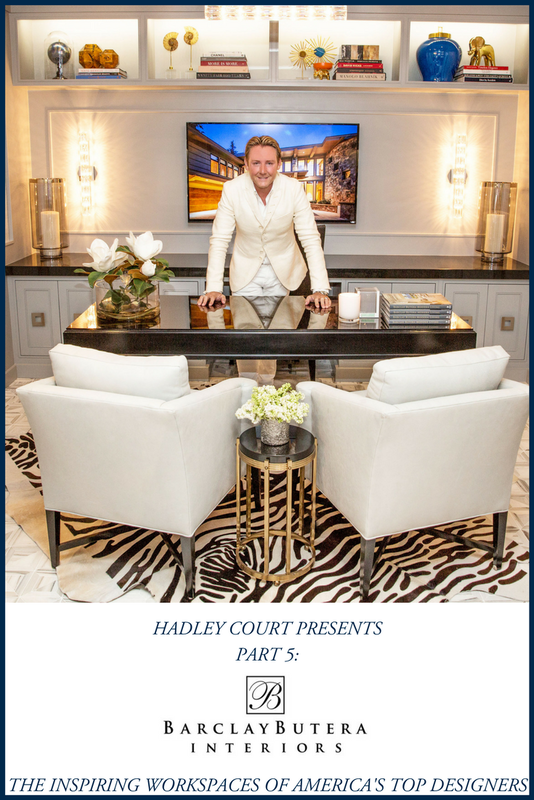 Q: HADLEY COURT: How do you set the mood for a client presentation? A. Barclay Butera: When you walk into one of my design showrooms, almost everything you see has been done on purpose, to communicate my brand’s aesthetic. From the music being played to my signature Barclay Butera candles that are always lit, to the the fresh flowers placed throughout the showroom. For client presentations, we step it up a notch to give a more personalized touch. We choose the type of music depending on the client and the project. Depending on the time of day, we serve coffee, mimosas or champagne with a side of delicious cookies served on fine china. All the small details add up to a luxurious presentation experience that our guests enjoy at all of my Barclay Butera Interiors showrooms. Q: HADLEY COURT: What branded presentation materials do you use? A: Barclay Butera: I am very big on branding and think it’s incredibly important to set yourself apart. I probably invest more on our marketing efforts than most design firms and I also insure that our level of detail is impeccable. Since we are also a retail showroom, we have branded bags, stickers, tags, blue and white wrapping paper and blue ribbon that we use to tie shopping bags and for the tags throughout the showroom. 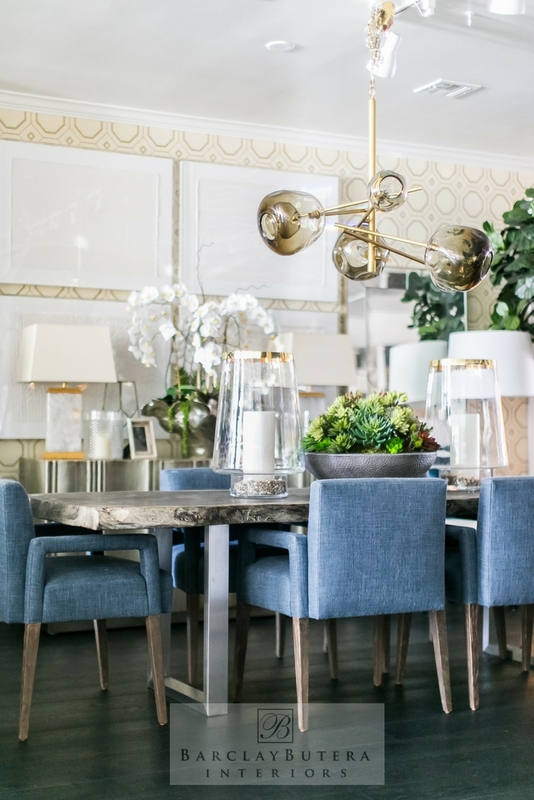 We are a luxury interior design firm, which showrooms located in some of the most affluent neighborhoods in the nation, and every detail counts. In regards to our design presentations, every member of my design team uses branded binders and places all product images on Barclay Butera branded stationery. 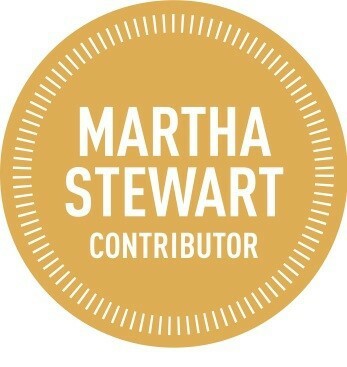 Everything we do is cohesive and consistent with our brand. 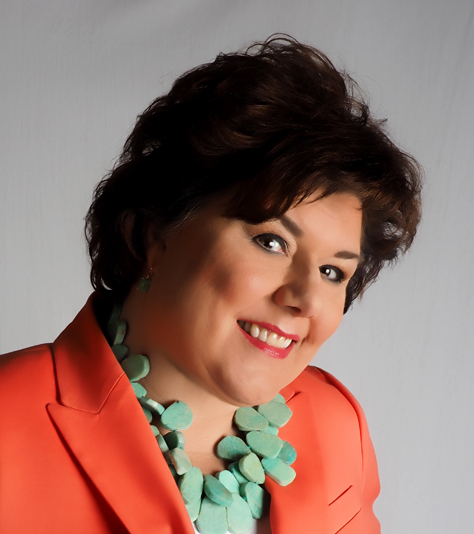 Q: HADLEY COURT: Do you utilize online tools in your business and in your presentations? What presentation materials do you give to your clients? A: Barclay Butera: One of the biggest investments we made this year was designing a completely new website. I believe that your website is also like your storefront, and should represent you in the best way possible. In today’s digital world, potential clients are most likely looking at your website before they meet you and often make the decision to purchase based on your digital presence. We’ve also dedicated more time to our social media accounts since there’s no better way to put your best foot forward to a potential client for free. We do have TV’s in all of our showrooms that loop our interior design work, however, we are still *old school* in that we do not present with Ipads. 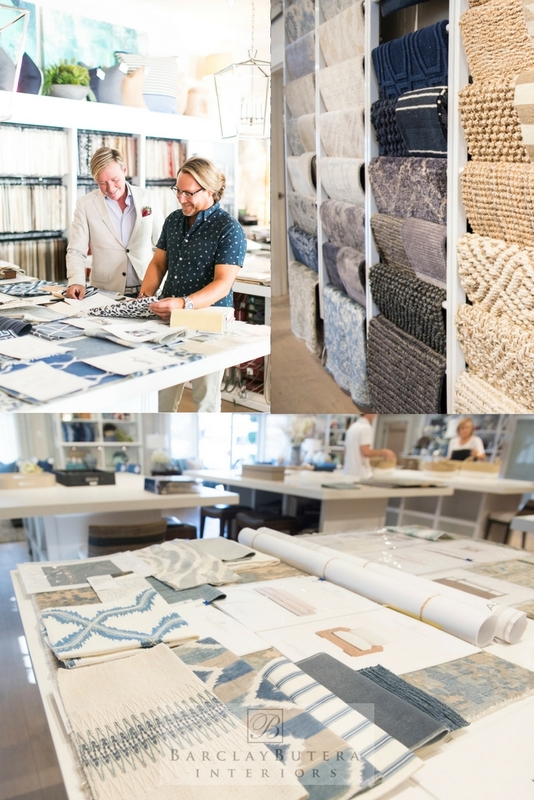 We find that our upscale clientele still wants to touch and feel fabric samples so we present with mood boards. With respect to the presentation materials we give to our clients, I want to rewind a minute and say that we always have an initial consultation with our potential clients – at their home or in our showroom. Once we determine the scope of their project, their needs and their budget, we present to our client and provide a thorough and detailed binder that is broken up by room. The binder includes all product selections, fabric samples, color scanned copies of any materials presented and floor plans so the client can view all of this at their leisure. We also have the ability to send this digitally, but, as I mentioned above, our clientele appreciates taking a physical copy home with them. Once the project is complete, the binder will be updated with everything that was installed in their home – which they can keep forever! Dear Readers: We hope you’ve enjoyed this inside look at Barclay’s beautiful and newly expanded Newport Beach, California showroom and offices and reading his answers to our questions! Has Barclay inspired you to rethink your own offices and workspaces? 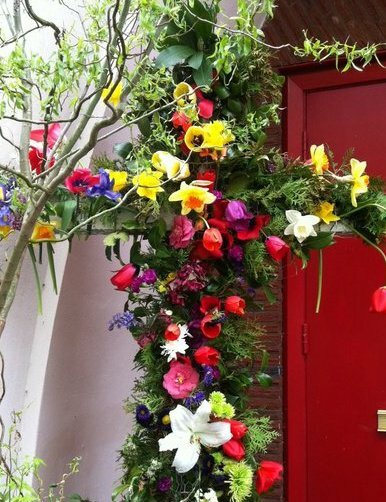 We’d love to know what you think in the comments! 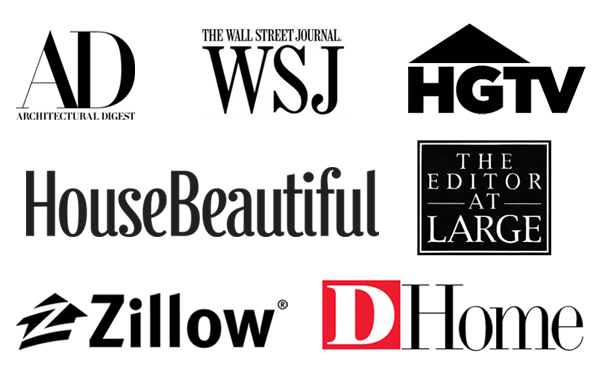 As always, we appreciate your time in reading and subscribing to Hadley Court. Please visit Barclay Butera Interiors new website at http://barclaybutera.com. All images provided by Barclay Butera Interiors.